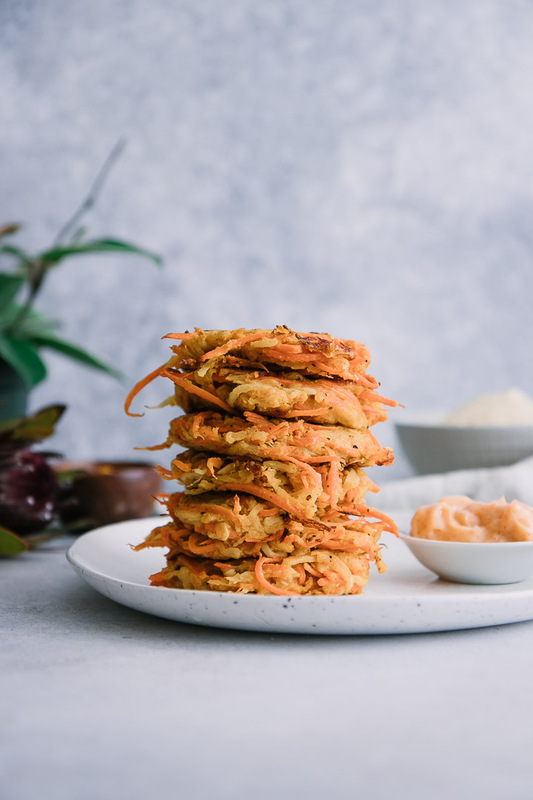 Turnip Carrot Cakes with Garlic Aioli, an easy pan fried veggie cake of shredded carrots and turnips with a simple vegan garlic aioli. Don’t turn up your nose to turnips! This recipe was originally posted in September 2017 and updated with new photos in January 2019. The first time I heard of a “veggie pancake” I turned up my nose. In my (limited) experience, pancakes were supposed to be sweet…right? A savory pancake? I just couldn’t wrap my mind around it. It wasn’t until I was studying to become a dietitian and took a job at a local restaurant serving organic Northern German food that I changed my tune. I remember seeing a beautiful turnip and carrot cake came out of the kitchen on a bed of arugula (my favorite green) and I decided then and there that I was open to trying veggie cakes. Let’s take a moment to talk about turnips. Let’s face it, turnips get a bad rap. Though not as popular in most Western countries, they are grown in large amounts in Western Asia and throughout China but they can’t shake their reputation as a peasant crop that children grow up hating. But turnips can and should find their way onto your plate. Sometimes mistaken as a root vegetable, turnips are actually an oversized stem. They are considered a cruciferous vegetable and belong in the same family as cauliflower, cabbage and kale. Turnips are in season in the northern hemisphere starting in in late summer through early winter but store well for months so can be enjoyed all winter long (likely why they gained the reputation as a vegetable eaten during times of scarcity). 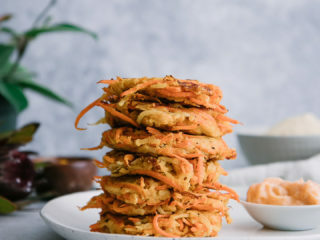 Any savory vegetable cake recipe is usually made up of shredded vegetables, a binder (typically eggs, or flax if you’re plant-based), some kind of grain or flour like breadcrumbs or cornmeal, and spices. The ingredients are then mixed together and pan fried to perfection. 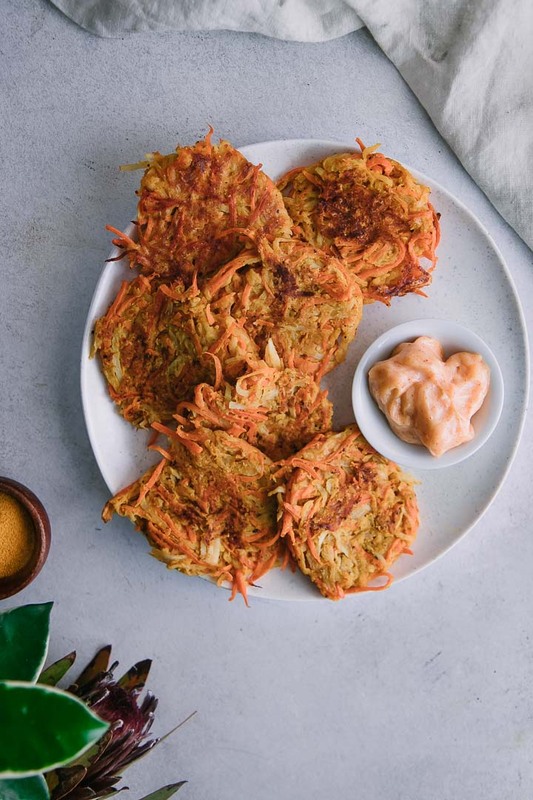 It’s a simple foundational recipe that can be customized depending on the vegetables used, and this recipe for savory pancakes made of carrots and turnips is no different. 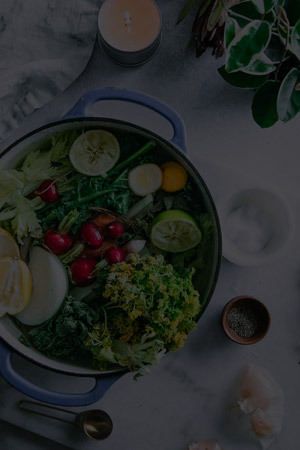 Use a stand alone vegetable shredder: there are many vegetable shredding tools available, but usually they are a stand-up shredder/spiralizer or a hand-held shredder (similar to a vegetable peeler, which also works). The issue with handheld shredders is it’s definitely a shoulder workout! 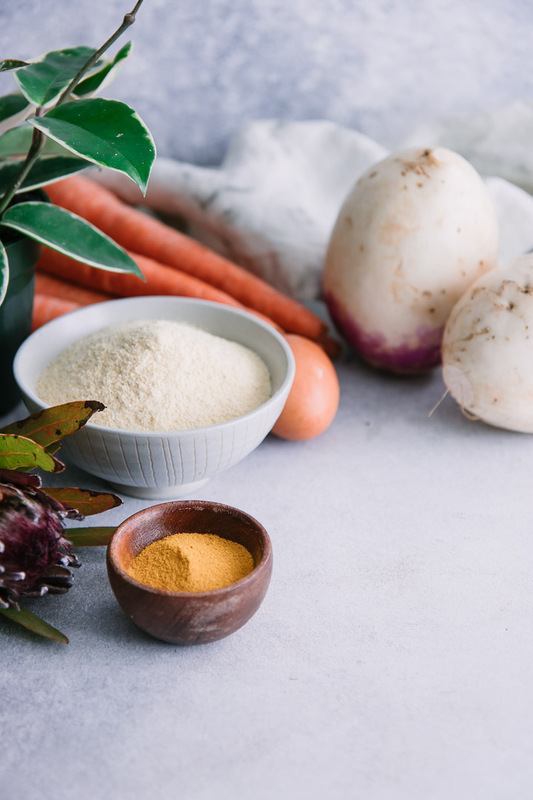 Once you’ve shredded the vegetables, add cornmeal, an egg, paprika, turmeric, and salt and pepper to a large mixing bowl and mix together until well combined. Then heat a small amount of oil in a large pan (I like using my cast iron skillet) and drop about 1/3 cup of the mixture onto the pan and flatten with a spatula. Cook about 2-3 minutes per side, or until browned. Serve with a side of garlic aioli, which is just mayonnaise (I use vegan mayo) with a bit of garlic, paprika, and salt. And there you have it, an easy vegetable cake that is sure to be a hit. We love cooking up a big batch and eating with vegetable side dishes or saving as salad toppers to eat throughout the week. Want to know my tricks for a perfectly cooked veggie cake? Read on for my turnip carrot cake tips. The perfect turnip carrot cake is crispy on the outside and chewy on the inside, which is the product of cooking the cakes on a hot (but not scorching) pan. I’ve cooked veggie cakes on a nonstick pan, but have found that my cast iron skillet gets the perfect crispiness I crave. The perfect turnip carrot cake uses flour or gluten-free grains to hold it together and give it structure. I used Bob’s Red Mill gluten-free corn meal to add stickiness to the cake and also add a slightly sweet corn flavor (I also use it in my Black Cherry Hoecakes). Want to make this recipe vegan? 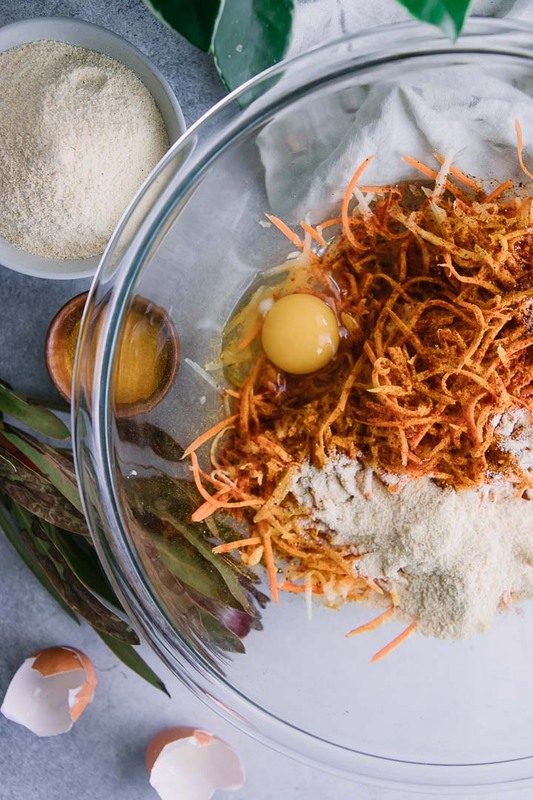 Replace the egg with aquafaba or a mixture of flax or chia seeds with water to create a sticky mixture that will hold together the shredded veggies. Also, try vegan mayo for the aioli! Love this simple savory vegetable cake recipe? Check out our other simple veggie protein-replacing recipes, like this Ginger Soy Tofu Bowl or Harissa Black Bean Quinoa Bowl. 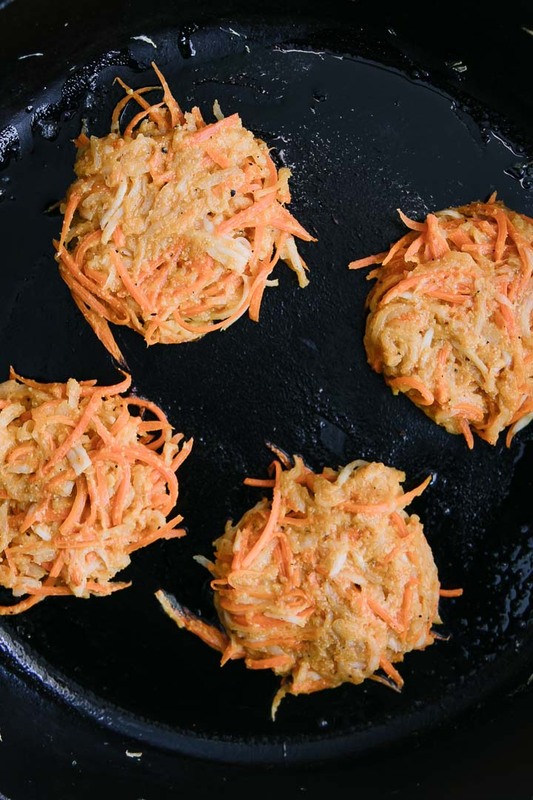 Did you make this Turnip Carrot Cakes recipe? Leave a comment below and rate the recipe to let us know how it turned out. Save this recipe for later by pinning to your favorite winter Pinterest board and make sure to tag me on Fork in the Road’s Instagram to show me your veggie cake creations! I love carrot cakes! We make a similar recipe but we don’t use egg, just use flax or aquafaba to make it vegan. I like that you included turmeric in this recipe I’ll definitely try that next time.